ScreenShot. Video source. YouTube. 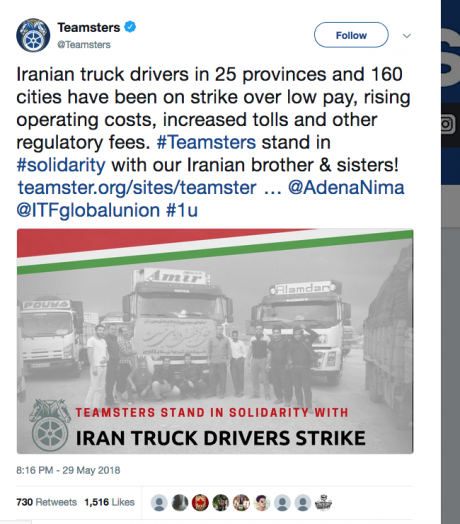 Woman trucker calls on fellow truckers to remain united.As the truckers’ strike in Iran enters its tenth consecutive day, despite concerted efforts by authorities to break and suppress it, and the many sacrifices that strikers and protesters are making, there is a sense of change and people power in the air. 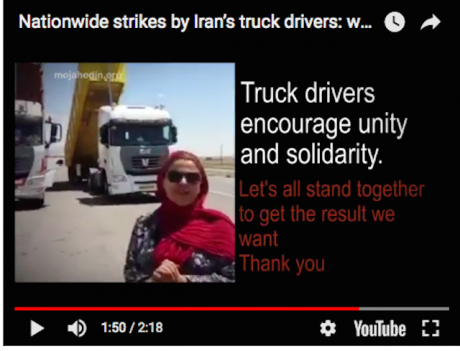 In a video posted on social media, a woman trucker calls on fellow drivers to remain united in the face of the authorities half-hearted attempts to win over segments of the truckers and says she and scores of other truckers are moving their trucks along the road to Qazvin with empty loads in protest, and calls on others to join them. Iran’s parliament speaker, Ali Larijani, signaled on Wednesday that Iran’s National Security Council is looking at the truckers’ strike, indicating that they view the issue as one of national security, a harbinger for more suppression. However, strikers have thwarted all attempts at forcing them back onto the roads until now. The government’s only recourse to addressing the strikers’ grievances is to meet their demands for higher wages, something it cannot do at the same time as it is funnelling billions of dollars into influencing outcomes in the Syrian war, the Iraqi political process, Yemen’s civil war, and incitement in the Palestinian-Israeli conflict. 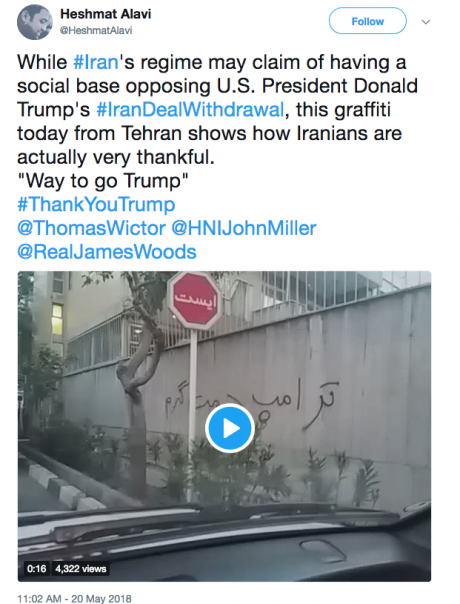 Video source: YouTube, The People's Mojahedin Organization of Iran.